If you enjoy superhero games, this is well worth a look. Publisher's blurb: "It has been called 'the best, most exciting superhero RPG in years.' It sets 'new standards in design and presentation.' It has won awards that include the Pen & Paper Fan Award for Best RPG, the ENWorld Award for Best d20 RPG, and the prestigious EN World Peer Award for 2003. Now the World's Greatest Superhero Roleplaying Game is even better! 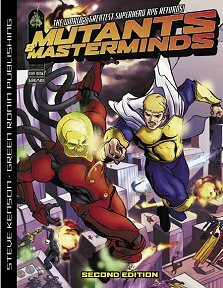 "Mutants & Masterminds, Second Edition, is all the best of the award-winning RPG, with new updates, refinements, and expansions to make it the most complete, detailed, and fun version of superhero gaming yet! In this 256-page hardcover with stunning new cover art by Ramón Pérez, you'll find a complete game. Based on the popular Open Game License, Mutants & Masterminds has everything you need to create your own superheroes and villains. It offers more than a dozen ready-made superhero archetypes and even more ready-to-use supervillain archetypes, so you can start playing right away! Included are two introductory adventures, one providing an introduction to the award-winning Freedom City campaign setting. "Don't let your super-powers fall behind! Mutants & Masterminds, Second Edition will take your game (and your heroes) to the next level!"